It happened to me. The leave-in conditioner I was using, the moisturizer that became my staple conked out on me. It stopped working and didn't moisturize my hair. I'd been using Cantu Shea Butter Leave-In Conditioner for a while now and it had been working great. Then after a bad relaxer touch up, the conditioner just didn't cut it anymore. So I decided to look for a new leave-in. 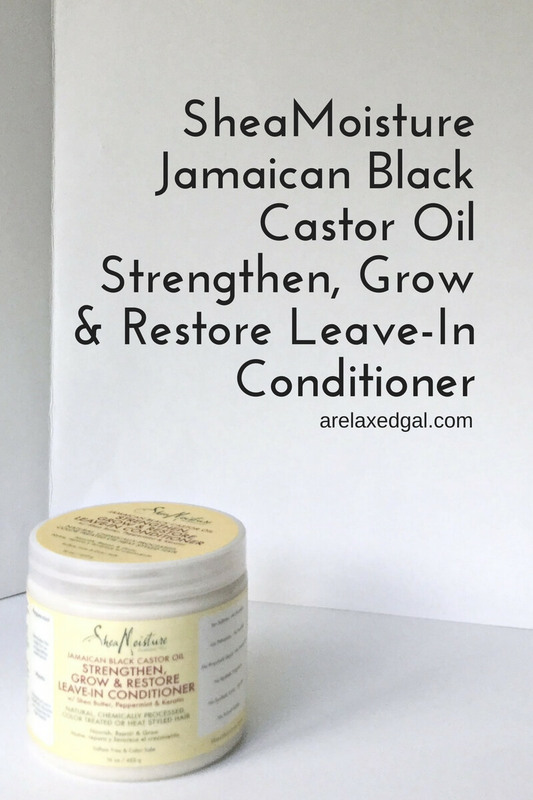 To start my search I looked online to see what the top leave-in conditioners were and after reading reviews and ingredient lists I settled on two - True Nourishing by Made Beautiful Leave-In Conditioner and SheaMoisture Jamaican Black Castor Oil Strengthen, Grow & Restore Leave-In Conditioner. 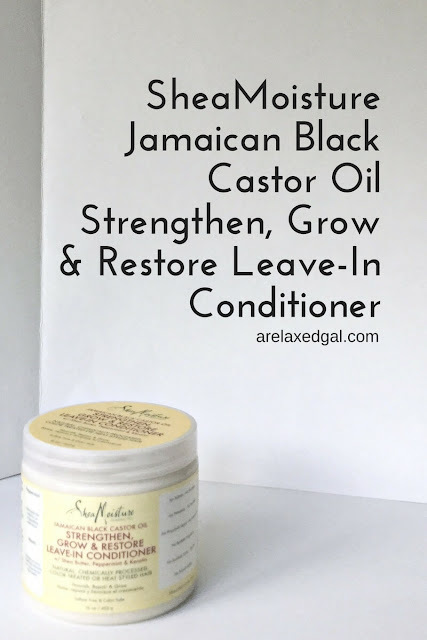 One of the reasons I selected the SheaMoisture Jamaican Black Castor Oil leave-in conditioner is I had tried and liked the shampoo. I tried the True Nourishing Leave-In Conditioner a few times and then switched over to the SheaMoisture Jamaican Black Castor Oil Leave-In Conditioner. Since I've switched over I've been using the SheaMoisture JBCO Leave-In Conditioner after each wash day and sometimes between washes if I feel my hair needs a moisture pick me up. Using it consistently will help me determine if it's a keeper or not. So this prompted me to purchase the SheaMoisture Jamaican Black Castor Oil Leave-In Conditioner again. "A reparative leave-in conditioner that softens and detangles hair. Nourishes, moisturizes, and supports elasticity so hair resists breakage when detangling. 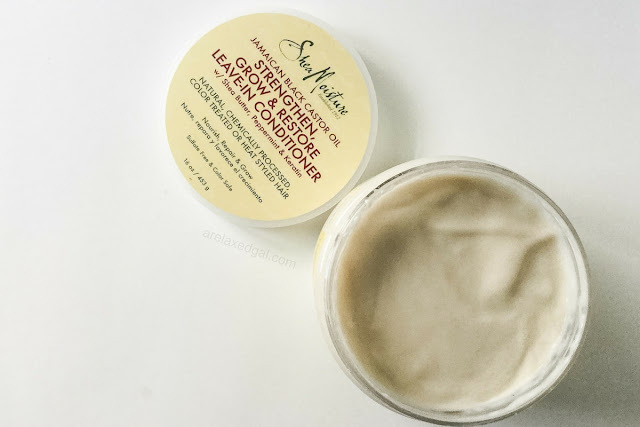 Conditioners provide a protective layer that improves the appearance of split ends. Peppermint oil stimulates the scalp for an invigorating experience." "Apply to clean, towel-dried hair. Work a generous amount of product into hair from root to ends. Comb through for even distribution. Do not rinse. Apply more to longer hair at the end of problem areas. Can also be used as a rinse-out conditioner." "Water (Aqua), Butyrospermum Parkii (Shea) Butter*, Cocos Nucifera (Coconut) Oil, Stearyl Alcohol, Cetyl Alcohol, Behentrimonium Chloride, Hydroxyethylcellulose, Panthenol, Glycerin (Vegetable), Simmondsia Chinensis (Jojoba) Seed Oil, Macadamia Ternifolia Seed Oil , Ricinus Communis (Castor) Seed Oil , Hydrolyzed Keratin, Fragrance (Essential Oil Blend), Mauritia Flexuosa Fruit Oil, Tocopherol, Aloe Barbadensis Leaf Juice*, Hydrolyzed Vegetable Protein PG-Propyl Silanetriol, Trifolium Pratense (Clover) Flower Extract, Hydrolyzed Rice Protein, Vinegar, Acetyl Tetrapeptide-3, Niacin, Dextran, Caprylhydroxamic Acid, Caprylyl Glycol, Butylene Glycol, Caramel, Mentha Piperita (Peppermint) Leaf Extract *Certified Organic Ingredient." Have you tried the SheaMoisture Jamaican Black Castor Oil Strengthen, Grow & Restore Leave-In Conditioner? Thanks for sharing! What are your favorite SheaMoisture products?